From Oregon Trail history to year-round skiing, we have the best, most unique accommodations – without the crowds. 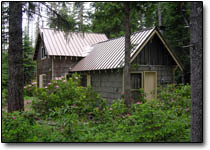 Summit Meadow Cabins are located 60 miles east of Portland, Oregon in the Cascade Mountain Range on the south side of Mt. Hood in an oasis of private land surrounded by national forest. Right out your door are miles and miles of hiking and mountain bike trails. 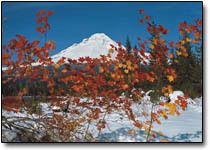 Trillium Lake is just 2 miles away. Take a short walk to Summit Meadow to enjoy wildlife, wildflowers, sunrises, sunsets and peaceful moments. Once the snow melts, you can drive right to the cabins on graveled roads. Consider fishing, mountain biking, hiking, nature observation, or just relaxing and soaking up the ambiance of the least crowded seasons. Many sites on the Oregon Cascades Birding Trail are located nearby. 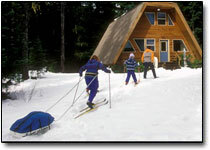 Miles of groomed and ungroomed Cross country ski and snowshoe trails start right from your door. A great place for a getaway any time of the year! cabins on Mt Hood since 1982.